This week's solar flare will likely go unnoticed by most people on Earth, but NASA says that might not be the case two years from now, when a peak in solar activity could cause trillions of dollars in damage to our high-tech infrastructure. 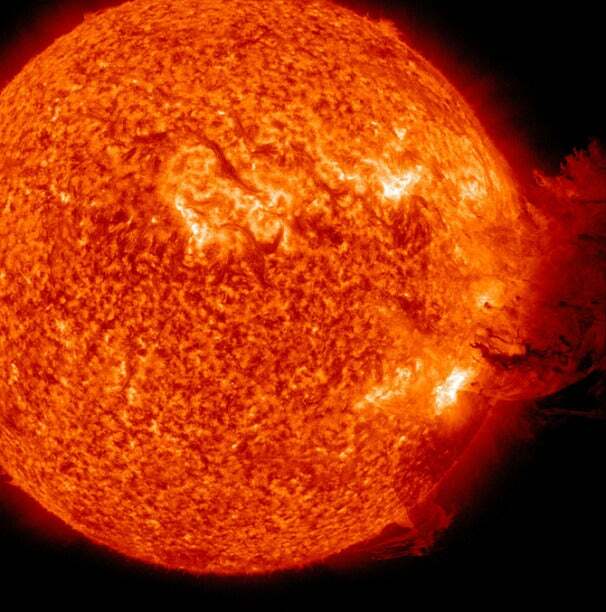 The sun released a huge solar flare Tuesday, shooting a bunch of radiation in our direction. While the Earth isn't expected to take a direct hit from the flare, it could rub up against the planet's electromagnetic field on Thursday, possibly disrupting radio and satellite transmissions, not to mention creating some spectacular auroral light displays for those in the north. Solar weather runs in cycles, and the current cycle is expected to peak in 2013. NASA is calling the flare medium-sized and the biggest one seen in the last five years, but it's nothing compared to something called the "Carrington Event" in 1859, a huge solar flare that set telegraph machines on fire and produced an auroral glow in many parts of the world bright enough to read by. Even when telegraph operators disconnected their batteries, "aurora-induced electric currents in the wires still allowed messages to be transmitted," according to a NASA historical account. Solar weather runs in cycles, and the current cycle is expected to peak in 2013, and it's during that time that we're most likely to see something like the Carrington Event. Only problem is that if such an event happened today, it would cause much, much more damage than it did in the 19th century. "The sun is waking up from a deep slumber, and in the next few years we expect to see much higher levels of solar activity," Richard Fisher, head of NASA's Heliophysics Division, said last year. "At the same time, our technological society has developed an unprecedented sensitivity to solar storms." Basically, if the sun were to send a massive shipment of electromagnetic radiation our way, it could knock out the backbone of our digital civilization, taking power grids, satellites and other communications systems offline for hours, possibly even days. There's also the possibility for damage to that infrastructure that could run into the trillions of dollars. Fortunately, there are precautions, such as back-up systems, that can be put in place, and solar weather watchers have been urging politicians to do so through conferences and other efforts over the past few years. Whether we'll be ready when the solar "Big One" comes remains to be seen, but scientists say it's not an apocalyptic scenario. So, presuming that the world doesn't end with the Mayan calendar in 2012, it also won't end with a huge solar flare in 2013, but it definitely has the potential to ruin a day or two.